SAN FRANCISCO — A sellout crowd sat in stunned silence. Denard Span threw his hands up and asked anyone within earshot, “What happened?” Heads dropped on the bench, one after the next. It’s hard to sum up two weeks of baseball with one play, but the Giants did it in the bottom of the eighth inning Friday. Brandon Crawford lined into a triple play with the bases loaded and the Giants down three. They lost 4-1 to the Nationals, dropping to 2-11 in the second half. The eighth inning started with a bunt single, bloop single and walk. Crawford, the Giants’ leading RBI man, hit a liner to first that defensive replacement Ryan Zimmerman scooped an inch above the ground. He beat Buster Posey back to first for the second out and then winged a throw to third to get Span, who went halfway down the line thinking the ball had dropped. The triple play was the first for the Giants since Sept. 6, 2009. Jeff Samardzija was sharp early, and a double by Conor Gillaspie and single by Gregor Blanco gave him a lead in the second. Blanco’s mental mistake in right helped the Nationals tie the game two innings later. With catcher Wilson Ramos on second and one out, Jayson Werth smoked a single to right. Blanco came in casually, apparently thinking Ramos would stop at third. He didn’t, and Blanco’s throw home was late and up the line. Young infielder Wilmer Difo led off the fifth with a hustle double and scored two batters later on Ben Revere’s clean single to right. Revere scored when Daniel Murphy blasted a ball 410 feet off the top of the wall in the deepest part of the yard. Given a lead, Max Scherzer cruised through seven. After putting two in scoring position in the third, Scherzer retired 14 of 16. Starting pitching report: A strikeout of Scherzer to end the sixth was No. 1000 for Samardzija. He’s the 50th active pitcher to reach the mark, and five of them are in the Giants’ rotation. 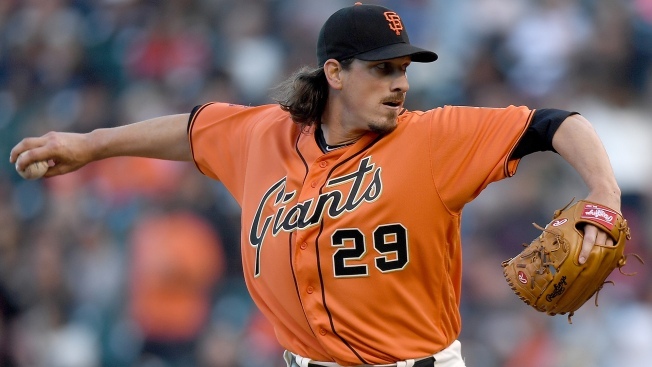 Samardzija was charged with four earned in his six innings. Bullpen report: Matt Reynolds faced three batters in the seventh in his Giants debut. He got two outs and walked Bryce Harper on a 3-2 pitch that was a coin flip. At the plate: The Giants have two more roster moves to make, with Hunter Pence due back Saturday and Ehire Adrianza back on Tuesday. Gillaspie is playing like a man who would like to stay, knocking two hits off Scherzer. In the field: Triple play with the bases loaded. Seriously. Attendance: The Giants announced a crowd of 41,959 human beings who hope Pence can stop this. Up next: Jake Peavy will face 22-year-old Reynaldo Lopez, a Top 100 prospect who will be called up to make his second career start.